Within the first six months of World War 1 over a million soldiers were taken prisoner. All nations involved could not predict the length of the war and it became apparent that the need to build more prisoner of war camps was imperative. Conditions within the camps vary depending on your enemy, location and even rank. These records not only include the names of military persons taken prisoner – both allied and foreign – but also the names of civilians, seamen, fishermen, diplomatic employees and more. Search through thousands of records from The National Archives by name, rank or regiment. These records are part of Findmypast’s wider Collection Prisoners of War 1715-1945. In association with The National Archives, Findmypast has digitised and transcribed this collection. For each record, you can view an image of the original document and a transcription of the information found in the document. Name - Many only include surnames. We recommend that you start your search with only a surname. In some records, a title may be included in the first name; such as, Herr or Freiherr. By viewing the original document, you can reveal even more about your ancestor. The image will also help you to put the information into a wider context and understand why your ancestor’s name was recorded. Because of the diversity of the documents you may find more than one record for an ancestor; such as, Thomas O’Neill, service number K22745, Stoker 1st Class, who had seven separate records in this set including a birth certificate. Use the arrows to the right and the left of the screen so you can browse through the rest of the document to discover more. There are several different types of records included in this set. A portion was created by the British war office and others are from foreign offices including Germany. Within the German records you will find parts written in German - to help we have included a list of some useful German words in our Discover More section. Use the keyword search to search for specific names of ships. The name variants will help when you are searching for your ancestor because many of the records were created by foreign officials so their spelling of your family name may be different from yours. This collection of records from The National Archives includes papers from the Foreign Office, Colonial Office, Admiralty and Air Force. The records include the names of thousands of both Allied and foreign people taken prisoner. This is not a comprehensive list of every prisoner of war. A supplemental list of prisoners of war from the First World War is available through the International Committee of the Red Cross. Through the records you can gain insight into the experience of a prisoner of war. Some volumes include inspection reports of prison camps which describe the buildings, provisions and equipment in detail. Other records hold testimony of British prisoners held in Bulgarian prisoner of war camps. The POWs represented in these documents are both Allied and foreign. Every branch of the military is represented – army, navy and air force. There are thousands of records of seamen being detained and records of whole crews of ships being held. In reports from East Africa and Turkey you will find names of missionaries, priests, sisters and friars. And in many there are names of civilians who have be detained by forces on all sides. We find prisoners held in Britain, Germany, France, Bulgaria and Turkey. Many of the reports and lists were typed on onionskin paper. You will see from the images it has a translucent quality. The paper is not actually made from onions, but given the name because it mimicked the translucent and thin quality of an onion skin. These pages were typed one-sided – thus in the images you will often only view pages on the right-hand side. In some volumes, the pages were tightly bound together. Tight binding can make it difficult to read the information closest to the seam. Within the first six months of the First World War 1.3 million Prisoners of War were captured. As the war stretched on longer than anyone had anticipated, the act of detaining prisoners became more burdensome. By the end of the war it is estimated that between 8 and 9 million people were taken prisoner. The rules for keeping prisoners during wartime were set by the previous Hague Convention. Every country was held to these regulations and the International Red Cross was used to inspect camps. Camps had to be built in haste after the start of the war. In some areas soldiers suffered from exposure because they had to sleep outside while their new camps were being built. Overcrowding, sanitation and food was a concern for most countries. In 1915 German, Austro--Hungarian and Russian POW camps suffered a typhus outbreak and thousands of lives were lost. Prisoners were used for forced labour – to build railroads, cultivate land or lay down new roads – since many of the countries were now affected by a shortage of labour. Sometimes they were forced to work in dangerous zones, close to the front lines. Britain delayed the use of prisoners for labour because of opposition from trade unions. They were not always held in the area where they were captured but could be sent to camps around the world. France sent prisoners to North Africa, Germany sent them to the Eastern Front and Britain used prisoners in France. POWs were central to the propaganda machines of all countries involved. Every country claimed that their prisoners were being mistreated or abused to persuade public opinion in their favour and to encourage soldiers to fight harder. Escapes or attempted escapes were not uncommon. Reprisal camps were created to hold those who had previously attempted to escape. At times they were used as objects of war and used in retaliation against enemy countries. Prisoners could be used as bargaining chips for governments and in the records we find correspondence related to prisoner exchanges. In the beginning years of the war the American embassies in both Bulgaria and Turkey played key roles, especially in the treatment and welfare of prisoners of war. Since America was a neutral country at the time, their consuls and diplomats were used as liaison for communications between belligerent countries. Some prisoners reported that they were helped by the American Embassy while they were interned. Examples of communications from the American Embassy in Turkey and the American Legation in Bulgaria can be found in ADM 1/8418/90 and FO 383/252. Life within the camps varied depending on the enemy country, region of the world and period of the war. In the records, we find reports from British soldiers who were held in Bulgarian prisons. They reported that they were robbed or beaten before being taken to camps. At the camps food was insufficient and they relied on parcels from friends and family. The parcels often included tinned food and cakes; however, they arrived infrequently and the post was not very organised. When they worked they were generally making roads or working on the land. One officer reported that a group of soldiers was taken from his camp and did not return. Parcels arrived for the soldiers and were forwarded on, but then returned. The group was being used as a working party, which was continuously moving. This observation demonstrates the feelings of uncertainty in the camps and how the prisoners could be moved at any time. Not all reports were negative. 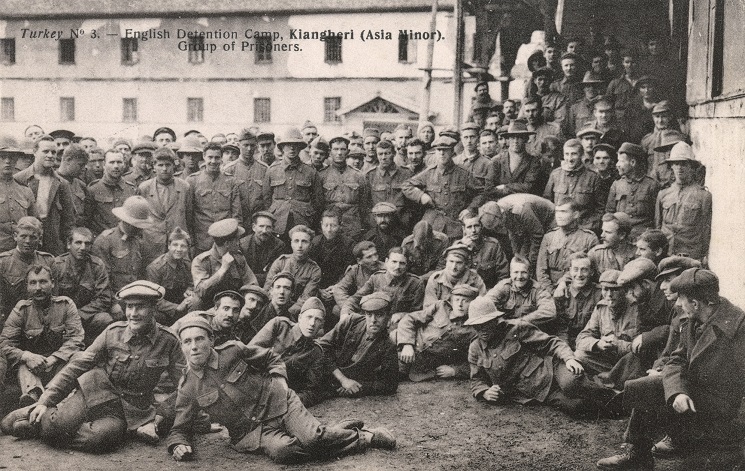 In December 1916 Lieutenant Gilliland reported from a Bulgarian camp that the health of the men was generally good and the officers were all well. Other soldiers reported being given money from the American Embassy so that they could buy their own food or provisions from the local town, which shows that there was a degree of freedom within some camps. All of these reports or observations can be found in volume FO 383/252. Gefangen an Bord von wann – When captured? In the records you will find a list of casualties and survivors from the submarine E.15. The submarine was grounded during a mission in April 1917 to break through the Dardanelles Strait as part of the Gallipoli campaign to capture Istanbul. In November 1915, Turkey entered the First World War as part of the Ottoman Empire. At the time of the Great War, the Ottoman Empire included parts of modern day Iraq, Palestine, Syria and Turkey. In 1917, the Allied forces created a plan to invade Turkey through the Gallipoli Peninsula. They set up a blockade of the Strait and used the town of Mudros on the Greek island of Lemnos as their headquarters. Other attempts had been made to break through the Dardanelles, but failed. The Dardanelles was a narrow strait that connected the Aegean Sea to the Sea of Marmara. By gaining control, the Allied Powers would have been able to continue their attack of the Ottoman Empire straight to the capital. However, it is a body of water that had protected the Ottomans for centuries because of its fierce under currents and patches of fresh water which affects a ship’s buoyancy. In order to move through the Strait during the First World War a vessel had to contend with a mine field, shore-mounted torpedo tubes, heavily fortified forts, anti-submarine nets and mobile howitzers. Just before dawn, 17 April, the E.15 submerged itself in order to pass under a mine field near Kephez Point, twelve miles into the Strait. While underwater it was caught in a treacherous undertow. The strong current forced the submarine to the surface and it was swept ashore in full view of Fort Dardanus. Captain Lieutenant-Commander T S Brodie (twin brother of C G Brodie who was captain of C11 when it sunk in 1909) attempted to free the vessel but it would not budge. The crew was receiving heavy fire from the Turkish artillery. As the captain opened the conning tower a Turkish torpedo came speeding towards the aground submarine, the shell exploded against the hull - the captain was killed instantly. Another torpedo exploded the battery compartment and steel plating was shattered by the force of the imploding sea. The sea and the broken batteries created a choking cloud of chlorine gas. The crew was forced to surrender. A Royal Naval Air Service aircraft was in the area and reporting back to headquarters. It was decided that the submarine needed to be destroyed so that it would not end up in enemy hands. A Turkish torpedo boat attempted to seize the prized E class submarine and had hooked it with a tow rope when the RNAS seaplane flew low and released bombs directed at the enemy ship. The attack missed the ship, but it was enough might to force a retreat. Repeated attempts were made by the British to destroy the E.15 and prevent the Turks from taking the wreck. Finally, in a last effort, picket-boats from two nearby battleships were sent to destroy the wreck. Under heavy fire from the Turkish army, Lieutenant Claude Godwin fired two torpedoes. E.15 was destroyed with a tremendous explosion which seemed to force the vessel off the mud and her hull erupted into flames. In the records we find the names of the men who were captured after surrendering and details of their wounds. Some had wounds from shrapnel, bayonets and bombs. Others were treated for dysentery. In the end the Gallipoli campaign had been a costly failure for the Allies – after months of fighting the Allied forces had to retreat.